Speak out! Put market forces to work on the roads. Read our response and then tell the Government whether you agree or not. Consultation ends this Friday, 18-Mar-2016. This is the response of Webb-site.com to the Electronic Road Pricing Pilot Scheme public engagement document. At last, the HK Government appears willing to do something that will upset vested interests for the greater public good. We support this. Road pricing is not in fact a new concept in HK - there are already charges for various tunnels, bridges and the Route 3 Country Park Section. Lessons can be learned from the implementation of those. It is remarkable that the tolls on all of those are the same at every hour of the day. This is not optimal. Even the MTR has an early-bird discount (or if you prefer, a premium outside that period) in urban areas to shift demand, although they don't follow through with differential pricing around the evening rush hour. Remember, you stripped the MTRC of its fare autonomy some years ago, and if you won't let them increase fares at peak times then they can't discount at off-peak times without losing revenue. For any chosen area of HK, some traffic normally passes through that area to destinations outside it (through-traffic) while other traffic has a destination within that area (destination traffic). If the charging area is too small, then some of the destination traffic will shift its destination to just outside the boundary, rather than not coming at all. For example, if you draw a small area with a car park just outside it, then that will boost revenue for the car park and reduce the deterrent to vehicle journeys. Congestion near the car park may even increase. Take care to ensure that the roads near the boundary can handle the increase. Through-traffic will tend to avoid the charging area, increasing traffic on roads near the boundary, so please ensure that these roads have sufficient capacity, or if they don't, then they too must have charging, perhaps at lower rates, the further away you get from the core charging zone, so we may need a core zone and an adjacent secondary charging zone. There is only a need for charging at times and in areas where vehicle speeds are below a target threshold. The Government collects, or should collect, detailed data on existing road traffic, but we are not aware of how detailed this is - whether, for example, it counts vehicles passing specific points in narrow time intervals. We call on the Government to publish all the data in an open, free, machine-readable form, with real-time updates, so that the community can analyse it, suggest where more data are needed, and help to design a solution. With insufficient data, we cannot make further comment on the charging area. The objective of ERP is to reduce congestion, so this logically requires the cordon-based mechanism, charging vehicles whenever they cross a boundary. You misleadingly call a scheme in which vehicles are only charged once per day, regardless of the number of journeys, an "area-based" mechanism, but it is in fact a daily-rate mechanism for crossing a cordon. In the daily-rate mechanism, vehicles are only charged for the first visit and not subsequent visits to the congestion zone. A daily-rate would have only a minimal impact on congestion, particularly because a large portion of the traffic comprises vehicles which visit multiple times per day, including buses and taxis. In a daily-rate mechanism it is also harder to vary the charge based on demand at different times of day. A charge should be made on both entry and exit during congestion times, otherwise the congestion will be higher in the evening rush hour. Some car owners may drive to work early in the morning, when the charge is low or zero, park their car in a car park and then leave in the evening rush hour, so they must be charged for the evening congestion. Coming to work early shouldn't exempt you from congesting the roads in the evenings. Taxi drivers or owners may complain about the ERP proposals and embark on their usual protests. The solution is to incentivise them to support ERP. Taxis should be allowed to charge the passenger double the congestion charge for a journey which enters or exits the zone, so that if they enter or leave empty, then their cost will be covered, while if they have passengers in both directions, then they will make a profit on the charge. Only if they are empty in both directions will they make a loss. Remember that private cars are more efficient users of road space than taxis, because they only occupy roads when they are actually on a journey. Charges should be calibrated to achieve a target average traffic speed, balancing the supply of road space with the demand for it. If the actual traffic speed is too low, then the charge should be raised. Conversely, if the speed exceeds the target, then lower the charge. Consequently, charges should vary at different times of day based on demand. At certain times of day (particularly overnight) the charge will consequently be zero. The tariff should be reviewed on a regular basis (say, every 3 months) so as to maintain the target traffic speed in response to shifting demand. There is nothing special about Sundays or public holidays except that demand may be lower then, justifying a zero charge, but if the weekday charging results in a shift in demand to Sundays then congestion charges may be needed. It is important not to raise expectations that Sunday should be a free-for-all day on which congestion does not matter. In some shopping areas, such as Causeway Bay, you may find that congestion is very heavy on Sundays. Stick to the principles and charge only to achieve a target traffic speed, regardless of the day of the week. Resist the political temptation to combine social engineering, vote-buying (in the transport sector) or social welfare with traffic management. If you exempt sectors or charge based on irrelevant factors then those who pay will feel that they are being charged to offset the congestion caused by those who don't, and the scheme will fail to gain public acceptance. The approach should be strictly based on the road space occupied by a vehicle and agnostic to the number of passengers it carries or could carry. So a car, taxi and light goods minivan should all pay the same amount (call it X), a motorcycle should pay 0.5X, a minibus or a light goods vehicle 1.5X, while a heavy goods vehicle or large bus should pay 2X. This will still result in a per-passenger cost which is lower for buses than cars, incentivising the use of buses, which are more efficient users of road space except when they are empty or nearly empty. 40 passengers on a bus that pays 2X will pay (via the bus fare) 0.05X each, while a person in a private car with no passengers will pay 20 times that. It is up to bus companies to structure their routes and frequencies to achieve higher occupancy so that the congestion charge is spread more thinly across fares. They may also add a small surcharge for congestion periods, incentivising passengers to use off-peak times. A per-vehicle charge also incentivises ride-sharing in cars and taxis. 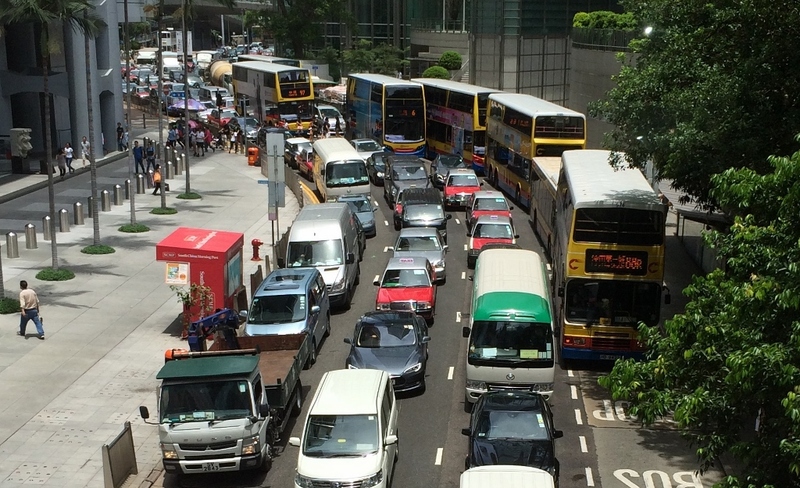 However, please see our article Busting HK's road transport cartels (14-Dec-2015). One of the causes of congestion at peak times is that the Government refuses to issue more licenses for public light buses (PLBs) and non-franchised buses, so those who need to travel by road use private cars instead. Electric vehicles don't produce road-side emissions, but they still occupy road space, slowing down the vehicles behind them, so they should pay the same as other vehicles. The only sensible exception is emergency-services vehicles. Other Government vehicles, including the black, chauffeur-driven limousines that ferry our senior officials and civil servants around, should pay the charge, even though the revenue goes back to another Government department. It would at least impact the departmental budget and make them think about using public transport as most people do. What you call Dedicated Short-range Radio Communication (DSRC), or put simply, tagging, is the way to go. We also suggest that the tags be easily removed and replaced, so that people who share the usage of a vehicle (such as taxi-drivers who rent a vehicle for a shift) can use their own tag. However, with a tariff based on vehicle size, there must of course be random checking using road-side cameras to ensure that people don't buy a motor-cycle tag and use it on a heavy goods vehicle. The same DSRC technology should be deployed in all parking meters in HK, so that vehicles are automatically charged when they park and until they leave. All lay-bys should also have meters. There should be a free period of 5 minutes for pick-ups and drop-offs. If your vehicle is still there after 5 minutes then you will be charged, and if it is a lay-by, then at a premium rate (say, double the normal parking rate), because a lay-by is supposed to be a drop-off and pick-up area, not a parking zone, and you need higher availability. This will stop the frequent practice of drivers hogging lay-bys and parking spaces without paying, triggering other users to stop in the road lanes. Charges on parking meters should be raised to meet demand - currently they do not exceed $2 per 15 minutes, which is, in many places, about one third of the cost of car parks. This often results in criminals controlling the spaces and creaming off the difference in "valet parking" rackets. Road lanes should also be strict no-stopping areas during congestion charging times, because a prime factor in congestion is when drivers stop in a curb-side vehicle lane waiting for their bosses or unloading goods, blocking an entire lane and causing dozens of vehicles to have to manoeuvre around them. Penalties must be raised and enforcement increased. There can be no real issue surrounding privacy. That was really just an excuse that the Government used the last time it proposed ERP, to avoid tackling vested interests in the transport sector. The reason not to be concerned is that the level of surveillance already open to the Government with its network of CCTV cameras and access to cellphone location data (from triangulation of base stations) means that tracking vehicle number plates does not materially increase the intrusion. If you are on a secret mission then you can always wear a disguise and take public transport using an Octopus card bought with cash. Obviously the effectiveness should be determined by whether the tariff has achieved the target traffic speed, no more and no less. Yes, the tariff should be reviewed, we suggest quarterly. Numerous factors affect road demand, including weather (demand may be higher in the hot-and-rainy season when walking is less attractive), fuel costs, incomes and alternative transport costs. See our proposals for parking metering and lay-by charges above. Abolish First Registration Tax (FRT). Owning a vehicle does not increase road congestion or air pollution. Using it does. See our article Traffic Truths, 1, 13-Apr-2011. Abolish annual vehicle license fees for the same reason. To reduce air pollution, reintroduce diesel duty and charge LPG duty too. For vote-buying and socialist reasons, duty on diesel and LPG has been set at zero while petrol duty remains at $6.06 per litre (unchanged in years). So goods vehicles, taxis, buses and minibuses are not paying for the air pollution and the consequent health care costs and economic losses caused by illness. You probably need to raise the duty level on petrol too. The revenue from road pricing and taxing LPG, diesel and petrol can offset the revenue lost by abolition of FRT and vehicle license fees. After limiting road usage with congestion pricing and deterring illegal parking/stopping in vehicle lanes with stiffer fines and enforcement, consider introducing dedicated cycle lanes and/or widening pavements for pedestrians by dropping one of the vehicle lanes. Encourage cycling with bike rental and parking facilities as many major cities have done. Do you agree or disagree with the Webb-site view? Submit your views to the Government anonymously using this form, or by e-mail to info@erphk.hk. The consultation closes on 18-Mar-2016.